Le Comte Ory - An opera in two acts. Libretto by Eugene Scribe and Charles Gaspard Delestre-Poirson. Director: Jérôme Savory; Designer: Ezio Toffolutti; Lighting Designer: Alain Poison; Lighting Director: Brian Turner. Following the last performance of Zelmira, his ninth opera seria for the city, Rossini left Naples in early March 1822. The composer was thirty. With increasing financial security his pace of composition had slackened allowing for a greater maturity and complexity in his operas. The impresario Domenico Barbaja, who had invited the composer to Naples, had arranged to take the Naples Company to Vienna and present a Rossini Festival there, starting with Zelmira. On the way Rossini and Isabella Colbran, his long-term mistress and the leading lady in all his Naples operas, were married. The Festival in Vienna was a great success with Rossini being feted everywhere. He made a lot of money, met Beethoven and saw a performance of Der Freischütz conducted by the composer. Whilst Barbaja hoped Rossini would sign another contract and return to Naples, Rossini was angling to present his works, and a new opera, in London. After the premiere of Semiramide in Venice on February 3rd 1823 Rossini and his wife travelled to London via Paris where they enjoyed a foretaste of Parisian salon society. They stayed in London for six months. Rossini presented eight of his operas at the King�s Theatre, Haymarket and also met and sang duets with the King. The stay in London was reputed to have brought Rossini many tens of thousands of pounds but no new opera was forthcoming. On his return to Paris, Rossini was offered the post of Musical Director of the Théâtre Italien, where casts featured the likes of Giuditta Pasta, creator of Norma, and Maria Malibran, daughter of the tenor Manuel Garcia who had sung in Rossini�s first opera in Naples. With the emergence of the tenors Donzelli, Nouritt and Rubini the composer was able to stage his own opera seria as well as his buffa works and the compositions of others. Rossini�s contract provided an excellent income and guaranteed pension. It also demanded a new opera from him in French, a command of which linguistic prosody he needed to learn. He would also need to amend his compositional style in the cause of re-aligning his Italian tradition and moving towards the French. All this was to take time and whilst there was some impatience at the lack of a new opera from him in French it was recognised that his revitalisation of the Théâtre Italien was demanding of his time. First though was the unavoidable duty of a work to celebrate the coronation of Charles X in Rheims Cathedral in June 1825. Called Il viaggio a Reims (a journey to Rheims) it was composed to an Italian libretto and presented at the Théâtre Italien on 19th June. It was hugely successful in three sold-out performances after which Rossini withdrew it considering it purely a pièce d�occasion. Rossini�s first compositions to French texts were revisions of earlier works with new libretti, settings and additional music. The first, Le Siège de Corinth, premiered on October 9th 1826, was a revision of Maometto II with the addition of an overture and additional pieces. It was a resounding success. Moïse et Pharon, a revision of the Italian Mosè in Egitto, premiered in Rome in 1817, followed on 26th March 1827. During the composition of Moïse et Pharon, Rossini agreed to write Guillaume Tell, his first, and as it turns out his last, completely new work for the Paris Opéra. Before doing so he wrote Le Comte Ory, making use of five of the nine numbers from Il viaggio a Reims. The plot concerns the Countess Adele and her ladies who swear chastity and retreat into the countess�s castle when their men go off to the crusades. Comte Ory, a young licentious and libidinous aristocrat is determined to gain entrance to the castle in pursuit of carnal activity. He does so first as a travelling hermit seeking shelter and charity. When this fails he returns disguised as the Mother Superior of a group of nuns, really his own men in disguise and who also fancy their chances with the pent-up ladies. Ory�s plans are thwarted by his young page Isolier, a trousers role, who is in love with the Countess himself. The timely return of the crusaders does likewise for the intentions of Ory�s fellow �nuns�. Love remains ever pure and chastity unsullied! I caught up with this production in the autumn of 1997 on the Glyndebourne tour following its successful run at the summer Festival itself from which this recording is derived. I am as enchanted now with the production and sets as I was then. The costumes are of the time of the crusades and the sets, with the backdrop of a pastoral scene and of the impregnable castle complete with drawbridge, are realistic and uncluttered. The production has one rather silly quirk with a group of dinner jacketed sommeliers bringing drink to Ory�s henchman Raimbaud as he sets up the local country folk for the arrival of the �hermit� (Ch. 2). Elsewhere the plot is treated with respect although there are moments of not wholly inappropriate burlesque as Ory�s nuns attack the castle�s wine cellar (Ch. 16). Ory, as Mother Superior, joins Isolier and the Countess in a trio as they shuffle round a tilted double bed in a humorous A la favour de cette nuit obscure (Under cover of dark night) (Ch. 18 and No. 10 in the vocal score). Such scenes require perfect timing. The extensive rehearsal time for which the Glyndebourne Festival is renowned is evident in both the acting and the singing of the soloists and young vibrant chorus. Annick Massis�s high, light and flexible coloratura soprano sings and acts an impressive countess Adele. Her entrance aria En proie à la tristesse as Adele relates her melancholy and sickness (psychosomatic subliminal yearning for some male company?) is expressed with tonal variety and pure well held vocal runs up the stave (Ch. 7). Elsewhere she shows rich colours in her lower voice (Ch. 11). Her only fault is some smudged diction among the vocal acrobatics. As the page Isolier Diana Montague is gamine of figure but her lovely high cheekbones and over-vivid lipstick betray her femininity. Her mezzo voice is in pristine shape and part of that package is plenty of vocal colour, steady legato and a wide range of expression that adds a convincing patina to her characterisation (Ch. 6). There are no weaknesses among the male singers. Ory, with a wide range and some high notes to reach is well sung and portrayed by Marc Laho without any evident vocal strain. I do not know him as a Rossini singer. His tone is firm and he has plenty of metal and heft in his voice. His high notes are taken from the chest and perhaps would have benefited from some honeyed heady tone as is found by singers of the role in some of the audio recordings of the opera. What makes his assumption compelling is his acting, particularly his facial expressions as both hermit in act 1 (Chs. 8-10) and nun in act 2 (Chs. 13-19). As Ory�s tutor Julien Robbins is physically imposing although his generally sappy and sonorous bass baritone has the odd dry patch in the mid-upper range of his voice (Chs. 4-5). Ludovic Tézier acts and sings with firm tone and clear diction as Ory�s henchman Raimbaud. 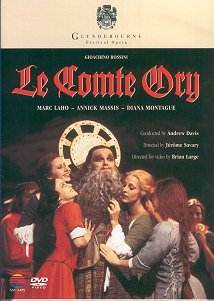 Le Comte Ory was a Glyndebourne favourite of Vittorio Gui. His mid-1950s performance was recorded by EMI. Together with recordings of Il Barbiere and La Cenerentola it very often stood alone under the composer�s name in the catalogue for nearly twenty years. Gui�s handling of the ensembles and finales has a touch not matched by Andrew Davis here or by John Eliot Gardiner on the 1988 Philips recording from the Opéra de Lyon. I have not heard the recent live recording from Pesaro featuring Juan Diego Florez (DG). I cannot see this masterly production being bettered on DVD in the near future. The high quality of the ensemble and the unity of the solo singing is matched by first rate audio quality. The video direction is by non-pareil director, Brian Large, who takes full advantage with close-ups that contrast nicely with the predominantly mid and long shots of scenes and arias. This set is a must for every lover of Rossini�s music and an excellent addition to the collections of those who only know the composer�s earlier buffa works Il Barbiere and La Cenerentola. Very strongly recommended.